To commemorate the two long decades since its famed Dr. Thomas preamp first graced dealers’ shelves, in 2003 Anthony Michaelson uncorked the Cockburn’s Special Reserve, polished the silver and launched a celebratory range of Tri-Vista products. The first two were the Tri-Vista 300 integrated amp (of which just 500 were made) and the Tri-Vista CD/SACD player of which 800 were produced. The final Tri-Vista preamp and power amp subsequently appeared to complete the train set. 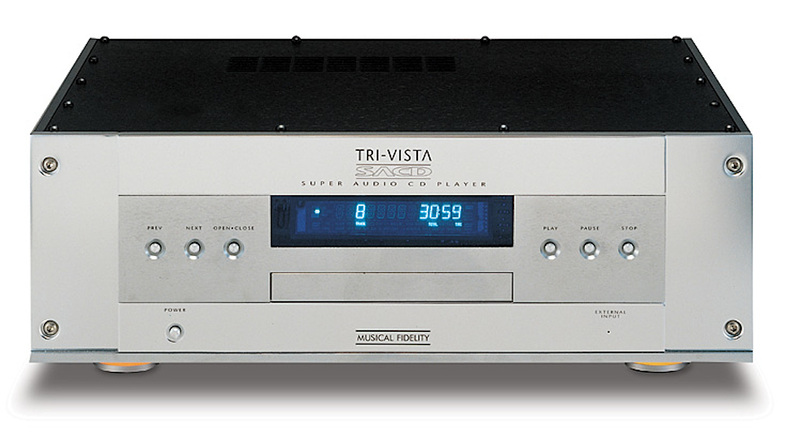 The Tri-Vista CD/SACD player started where the Nu-Vista 3D CD player left off, being fully specified with upsampling (at 192kHz), fancy power supplies (choke regulated) and fine-tuned DAC and filters, bespoke for both CD and SACD. Specifically, a 24-bit, 192kHz upsampling DAC was fitted, which not only did in-house conversion duties but has the ability to accept an external source – a brilliant feature, and rare in its day. CD and SACD circuitry was totally discrete with completely separate digital paths. As its name cunningly suggests, the Tri-Vista series used dinky 5703 subminiature valves, the result of scouring the world of military surplus for a successor to MF’s beloved Nuvistor. Claimed to be ‘the most reliable tube in the world’, this player’s designer said at the time that its very low output impedance and distortion allied to high damping factor and wide bandwidth make it ideal for super audio applications. This player shows attention to detail outside too – its silver moonstone finish (apparently the result of a nine step polishing process) has an arresting sheen. Unfortunately though, the feet glow. While the current is stabilising and the output stage is switched off, they glow red. Then they go amber for about half an hour while it warms up, then blue when it’s really ready to rock. I found this in very dubious taste back at its launch, and haven’t changed my mind since. The disc tray was beautifully hewn, up there with the Linn Sondek CD12 in the pantheon of ‘great drawers I have seen’. Shame about the top plate, which was soon resonating away in time to the low frequencies emanating from my loudspeakers. The wealth of ugly exposed screwheads were frankly embarrassing for a player of this price. Round the back, there were a pair of digital outputs (coax and optical) and inputs (for the aforementioned DAC function), plus the audio outputs – all two of them. At the time, all SACD had multichannel outputs, so this was eerily prescient in predicting how hi-res was going to play out. The Trivista SACD was a lovely sounding silver disc spinner, with a very Naim-like ability to really carry the music’s rhythms and phrasing – but it could also do tonal colour brilliantly too. It had a sumptuously sweet and creamy midband which was virtually unheard of back then, but still sounded really is grippy and fast with oodles of power to project the soundstage way out past (and behind) the plane of the speakers. Transparency was another strength – you could hear the different sounds of different studios and instruments, microphones and mixing desks rather than getting one generic sound. The punch and power, allied to a deliciously open and smooth midband and silky treble make even standard CD a deeply rewarding experience through this player – you never know, this digital lark may just catch on after all! On SACD, this machine proved exquisitely smooth and silky, brilliantly expressive and emotive – making digital a truly special experience. This is a beautifully musical silver disc player – it has one an almost enchanting quality that makes you want to keep listening. Importantly though, it is so smooth and open that you can keep listening for long periods without fatigue – just like vinyl. Sadly though, not every Tri-Vista SACD has stood the test of time, with transport electronics problems reportedly making it less of a safe second-hand bet than other ageing silver disc spinners.